It’s been a long run of mediocrity for the New York Islanders. The last time they advanced past the second round of the Stanley Cup Playoffs was 1993: after winning in six games against the Washington Capitals, they quite infamously eliminated the Penguins with a Game 7 overtime winner at the hands of David Volek. The series win derailed hopes of a Penguins’ three-peat, and also stole from us what would have been an intense Penguins/Canadiens Eastern Conference Final. The Canadiens ran over the Islanders in five games en route to their twenty-sixth Stanley Cup in a seven-game classic against Wayne Gretzky’s Los Angeles Kings. The Islanders would make the playoffs again the following year, but fell in the first round to the eventual Cup champions, the New York Rangers. Including that 1994 playoff appearance and this season’s berth, the Islanders have been in the playoffs just nine times in twenty-five years. They made it out of the first round just once, in 2016, as they beat the Florida Panthers in six games; they would lose in five games to a Tampa Bay Lightning team which was then beat by the eventual Cup champions, the Pittsburgh Penguins. In that same twenty-five year stretch of time, they actually managed to finish last in their division nine times…as many times as they made the playoffs. So, to summarize: the Islanders have spent an entire generation either being terrible or being the footstool for some other team on its way to immortality. All of this miserable hockey has of course led to a good number of high lottery picks over the last twenty-five years: eighteen top-ten picks, twelve top-five picks, and two first-overall picks. I’ll get to those two number-ones in a minute. Now, the guy who has played the most games in his career out of all of those draft picks is the inimitable Zdeno Chara, drafted in the third round, fifty-sixth overall, in 1997. He’s played for three teams in his career, almost two-thirds of it with the Boston Bruins, but by far the fewest and least successful were in his four seasons and 231 games with the Islanders. The Islanders clearly did not know what they had with Chara, and they traded him on Draft Day, June 23, 2001, with the Islanders’ first-round pick and Bill Muckalt in exchange for Alexei Yashin. (The Senators would draft Jason Spezza with that first round pick.) After leaving the Isle, Chara became a perennial All Star and Norris contender, but if nothing else he has been a crucial #1 defenseman for at least a decade. Wade Redden: drafted second overall in 1995, he was traded to Ottawa in the January after his selection for (get ready for “Let’s Remember Some Mid-to-Late-1990s NHL Guys”) Don Beaupre, Bryan Berard, and Martin Straka. Redden played over 800 games for the Senators. J.P. Dumont: drafted third overall in 1996, also never set foot on the ice for the Islanders. Played over 800 games in his career. Ryan Strome: fifth overall in 2011, is now a guy for the Rangers. Nino Neiderreiter: yes, the Islanders drafted this offensive dynamo fifth overall in 2010. He played all of 64 games for the Islanders before being traded to the Wild in 2013. Kyle Okposo: seventh overall pick in 2006. Had some half-decent years, but is now languishing in Buffalo. The only guy left of all of these top-ten picks is Josh Bailey, the Islanders’ second-leading scorer this season with a whopping *checks notes* 16-40—56, which is identical to Kris Letang’s boxcars from this season, and Letang: (a.) is a defenseman, (b.) was the fifth-leading scorer for the Penguins, and (c.) missed seventeen games this season, compared to Bailey’s zero games missed. Get the hell out of here. So! Luongo was one of the two first overall picks in twenty-five years for the Islanders, and the other one was John Tavares. Tavares had a very successful tenure in New York, starting in his draft year in 2009 at the age of 19 with a 54 point campaign. That rookie year, when he placed fifth for the Calder, was actually his lowest production in a non-lockout season in his career. He was a finalist for the Hart trophy twice as well, in 2013 and 2015, and he was the Islanders’ captain from 2014 until last season. So, when the Islanders were faced with the expiration of his bridge contract…well, they couldn’t do much because he had a modified no-trade/no-movement clause in the last two years of his deal. Anyway, this year’s Islanders are the second seed in the Metropolitan Division, so for many people that will make them the favorites. The Islanders had the kind of success they did this season by allowing the fewest goals and having the best save percentage in the whole NHL. They got a near-even split out of their two main goaltenders: Robin Lehner played 46 games, while former Penguin Thomas Greiss played 43, and both of them had some great stats on the year. However, the Islanders’ goaltenders were cushioned by a defense which allowed the 20th-fewest shots against. Nevertheless, this League-leading save percentage is what’s largely responsible for their League-leading PDO (save percentage plus shooting percentage). With a twelfth-most expected goals against, the Islanders actual/expected goals against differential was -52.5, which appears to be the highest in the League. In other words, the goaltending bailed them out in massive fashion. Can Lehner and Greiss continue to be relied upon? As was implied earlier, the Islanders offense is not their strong suit by any means. They took the fourth-fewest shot attempts and the third-fewest shots on goal, though they tied with the Chicago Blackhawks for the eight-best shooting percentage. In total they scored the tenth-fewest goals in the League. Their power-play was third-worst in the League, while their penalty kill was only 0.18% better than the Penguins. Neither team was heavily penalized during the regular season (New York: fifth-fewest power plays against; Pittsburgh: sixth-fewest), but while the Penguins scored 75% of their goals at even strength, the Islanders scored 82.5% of their goals at even strength. Looking at things in a broader sense, at least in terms of how the regular season matchup went, this series figures to be a tight one. The Penguins and Islanders this season met each other four times over the span of 42 days, from October 30 to December 10, and the results were very tight: two wins for each team, one win in a shootout each, one win each at home and on the road, and the cumulative goals, not including the shootouts, was 12-11 in favor of the Penguins. It does stand to be pointed out that the Islanders have made no trades this season, while the Penguins have made seven since the last time the two teams met. Two of those trades brought three pieces to the Penguins that have been instrumental in turning the team around, with Erik Gudbranson, Nick Bjugstad, and Jared McCann coming to plug some holes in the Penguins’ lineup. So, where does this leave us for this series? Well, as I said in yesterday’s playoff preview, I think the Islanders are frauds. Trotz is going to have fun trying to get the line matchups he wants while also trying to squeeze offense out of his trigger-shy group. Trotz tried a few different things against the Penguins in their meetings this year, but oddly the matchup that seemed to work best against the Crosby line at home in New York was the trio of Matt Martin, Casey Cizikas, and Cal Clutterbuck – the Islanders “fourth” line. This trio lost the Corsi battle against the Crosby line back in their last meeting in December, but tied in shots on goal and allowed no goals in both matches in Brooklyn. It is possible that either the Cizikas line or the third line of Anthony Beauvillier, Valtteri Filppula, and Leo Komarov will get the assignment against Crosby, freeing up Anders Lee, Mathew Barzal, and Jordan Eberle to try and produce against the Evgeni Malkin line. One way or another, get used to the idea of defenseman Ryan Pulock working against Crosby. Amongst the Islanders’ defensemen, he was the leader in points and time-on-ice, and he and Adam Pelech are the top pair for New York. Against the Penguins this year, he was on ice for five goals scored against two allowed…that’s good when your primary assignment is Crosby. This means the pairing of Nick Leddy and Johnny Boychuk will likely see the Malkin line; those two were on the ice for two goals for and none against in their last regular season game against Washington’s second line. That leaves the third pairing of Scott Mayfield, the team leader in blocked shots, and Devon Toews, who are no slouches themselves. I’ve yet to really mention Matt Murray, but it’s good to have him back and playing like his normal self. He had a weird first half this year, and it felt like whatever was bothering him from last year, be it the death of his father or some health problem, was lingering a bit too long. But he ended up bouncing back and in some ways turning out and having the best year of his still short career. One thing that has been a running theme for Murray is that he’s had trouble when facing fewer than average shots per game: this year when he faced 32 shots or fewer he was 9-16-1, and when he faced 33+ he was 20-3-1. In the two games he faced the Islanders this season (one in relief), he was 0-1-1 with a save percentage of 0.829; in neither game did he face more than 26 shots. The Islanders took 32 shots or less in 56 games this season, and they went 29-24-3 in those games. So here’s me saying that Murray either has to get comfortable facing fewer shots, or the Penguins have to allow more. I’m not sure which is better, but whatever keeps the pucks out of the Penguins’ net is the right answer. Ultimately, the regular season results are largely irrelevant in the playoffs; what matters is talent, production, and experience. 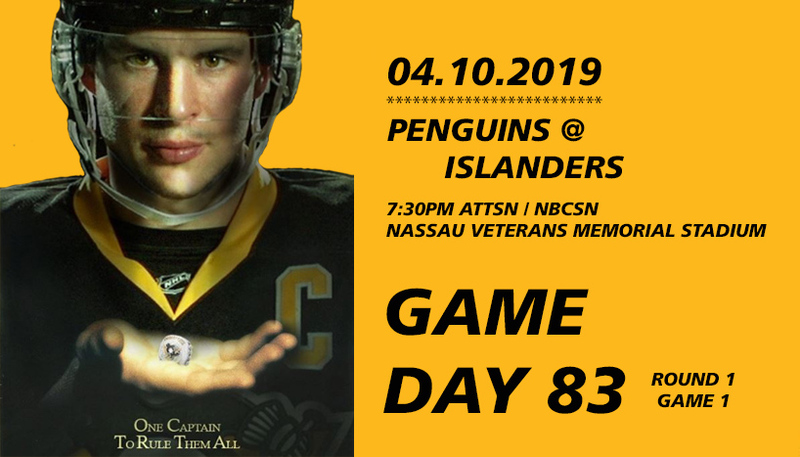 Even without the Penguins at full health, they have all of their major components back in the line-up, and there is no good reason for the them to have trouble with the Islanders in a seven game series, even if New York has home-ice advantage. With Brian Dumoulin and Zach Aston-Reese inching closer, that will only help to bolster the Penguins’ depth against an Islanders team that is going to rely heavily on their goal prevention to keep games in reach. Pittsburgh has to get the power-play running smoothly again and take full advantage of the man advantage as often as they can. Matt Murray being on his game will negate whatever goaltender advantage the Islanders will have, regardless of if it’s Lehner or Greiss the Penguins face. That leaves the Penguins offense against the Islanders defense, and that’s a victory for Pittsburgh all day.